It is with great sadness that Charlotte’s family have to announce that she died on June 19th, nine months after being diagnosed with breast cancer. You can listen to her music here or buy it from this website. 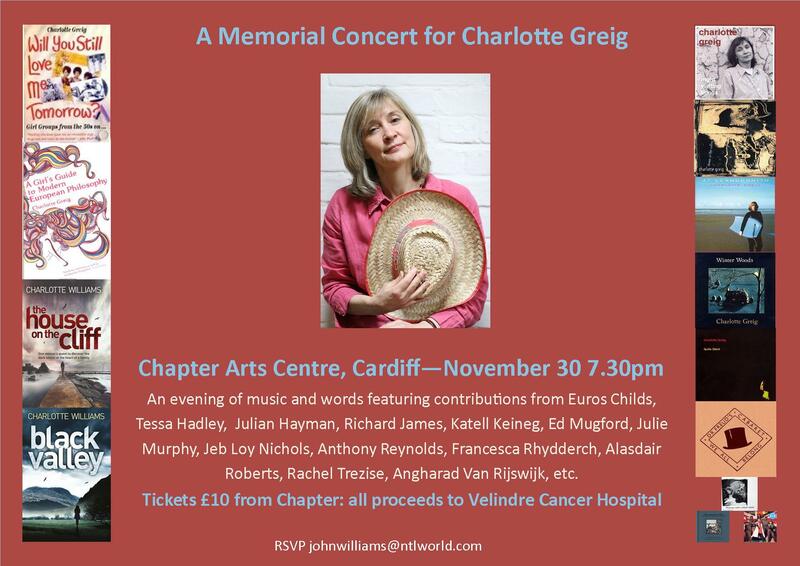 Her books – as Charlotte Greig and, more recently, as Charlotte Williams – are available from Amazon. A final novel, Black Valley, will be published in August. There will be a memorial service in the next few months to which all will be welcome. Details will be published here. Meanwhile, I’ve just delivered the next novel in the series. It’s entitled Black Valley, and will be published in August. It’s also set in Wales, this time in Monmouthshire, and concerns the theft of a painting and ensuing skulduggery.My research involved taking a look at the world of contemporary art, so I visited a few exhibitons and galleries in the UK and Europe, and read some guides to the scene, including Seven Days in the Art World by Sarah Thornton, and The Twelve Million Dollar Stuffed Shark by Don Thompson. Thornton’s book paints a vivid portrait of who’s who in the art world, and how it functions; Thompson’s explores the crazed economics of it all, and is equally fascinating. The US edition of my novel has been published by HarperCollins. It’s had a good reception there. 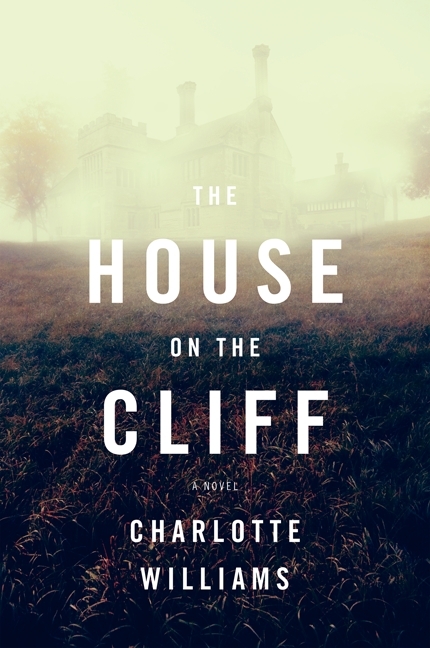 Here’s a review: ‘ This solid domestic suspense debut, nicely seasoned with gothic elements, should please Gone Girl fans and those who crave a real page-turner. 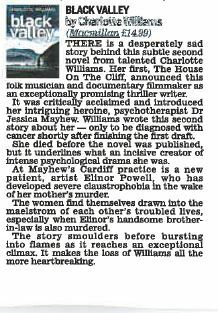 Williams’s 40-something psychotherapist makes a particularly vulnerable protagonist. While Jessica might be the worst therapist ever at keeping her personal agenda out of the session, readers will admire how Williams has created such believable characters and how she weaves effectively psychological theories throughout.’ (Library Journal). Actually, I had to alter the narrative of the book slightly to meet the demands of the American market. The American term for crime novel or thriller, as far as I can gather, is ‘mystery’. And the American reader likes a mystery to be a proper mystery i.e. the reveal must come out of the blue. So for this edition, I had to make the ending more of a complete surprise, and add a few more red herrings. Possibly an improvement, possibly not, depending on how mysterious you like your mysteries to be. 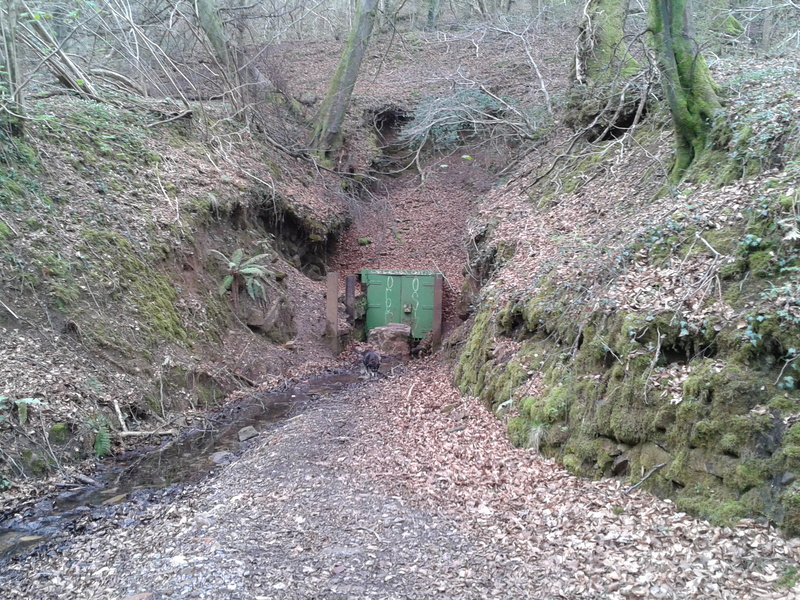 This week I went up to Garth Hill just outside Cardiff to look at the site of an abandoned iron mine, where I’m setting the final part of my new crime novel. It proved just as atmospheric as I’d hoped. Turning off the main road towards Gwaelod y Garth, the former mining village that sits on a hilltop above the city, there’s a gravel path that leads through the woods to a huge quarry. The sides of the quarry have been blasted off in such a way that peregrine falcons now nest there. Walking through the surrounding trees – at this time of year, full of wood anemones and wild garlic – you can see down into some flooded caverns that form part of a warren of tunnels dug through the hill. From the nineteenth century, a million tons of iron was mined here, and you can still see remains of a tramway that carried the ore to the ironworks. Since then, parts of the tunnels have been flooded, the minerals giving them a strange blue hue, like lagoons. There are also yellow pools, deriving their colour from the ochre that was also extracted here, and used for paint. Lower down the hill, we found the entrance to one of the tunnels. The heavy iron gates were not locked, so we went in a little way. Inside, it was very eerie, the sound of dripping water echoing around, and shafts of light coming in from holes in the ground above. 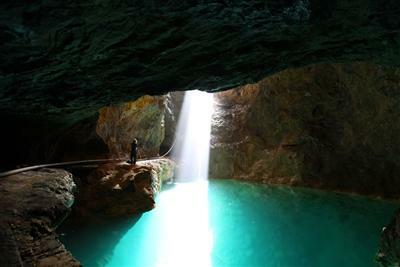 Horseshoe bats live here, apparently, and blind cave spiders. I noticed that the wooden planks forming the walls were still in immaculate condition, not rotted at all. Later in the week, I went to see a short film by John Evans, a bird watcher and poet who’d trailed a goshawk for two years, up in rural parts of the valleys. It was quite unlike the usual wildlife film, giving a truly visceral sense of how this fierce, secretive bird lives its life. For example, many small birds live close to the goshawk because it kills larger birds that prey on them (it doesn’t bother with the little ones) – so in this sense, it truly is ‘king’ of the forest. Also, the goshawk’s harsh cry is used in all sorts of films to evoke the loneliness of a rural spot – even when it’s the kind of landscape that a goshawk would never live in. (In that way, its call has become a familiar trope, but one that most of us don’t know the origin of.) Like Garth Hill, the rural parts of the valleys are largely ignored, even though they teem with wildlife, because we don’t ‘read’ them as countryside … just as wilderness. 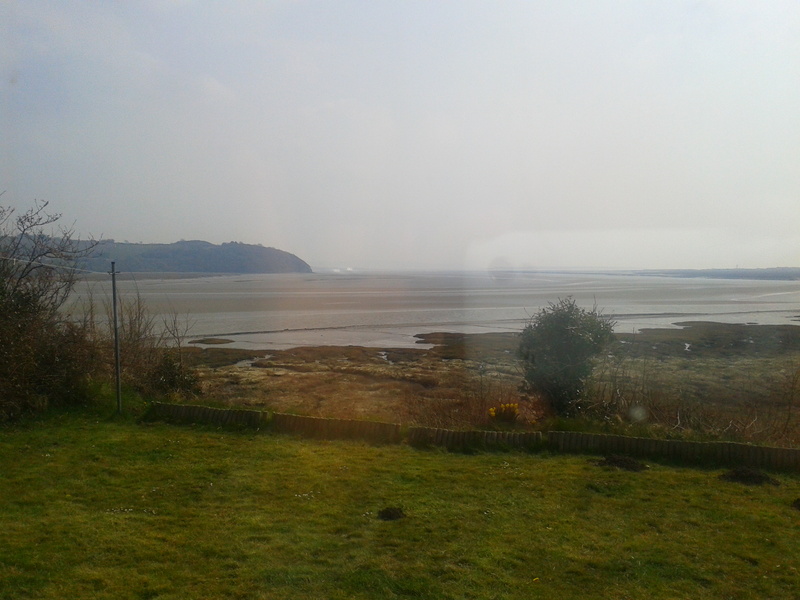 I returned last week from the Laugharne Weekend Festival which I attend every year. This year, there was a marquee for book readings and a food fair in the castle grounds, as well as the usual indoor events in the village hall, the congregational church, the boathouse, and the rugby club. The only trouble was, on the Thursday before everything kicked off, it was freezing cold and trying to snow. However, the following day, as if by magic, the clouds parted and we had glorious spring weather. The crowds seemed ecstatically happy, and there was a general air of elation at being outside in the sunshine at last, after such a long winter. Also because the line-up of artists was great – so much to see and hear. I was involved in a couple of events, the first on Friday night, a tribute to Nick Drake by Joe Boyd, his former producer. 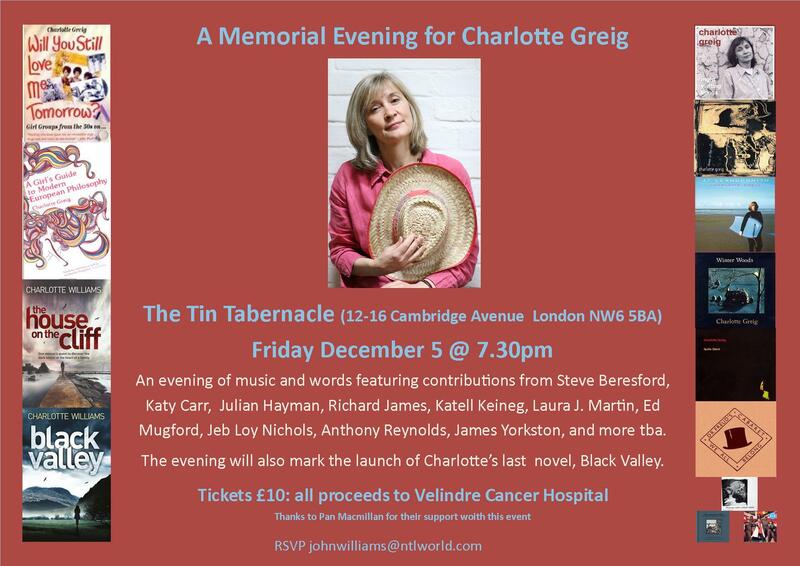 It was fascinating, and I was honoured to take part, singing a song by Nick’s mother, Molly Drake, at the piano. In the marquee on Sunday I also did my own event, reading from The House on the Cliff, and talking to Peter Finch, whose new book Edging the Estuary, is out soon. And I did make a point of going to see veteran crime writer John Harvey, and Alasdair Roberts playing in the church on the Sunday night – a wonderful end to the festival. Not to mention, of course, Laugharne’s Got Talent in the rugby club, where the Lone Wolf and Dragonslayer – a music-hall family combo from the Isle of Sheppey – were seeing out the night in suitably raucous style. Afterwards we stayed on in Laugharne for a few days in a place overlooking the estuary where Dylan Thomas had his boathouse. 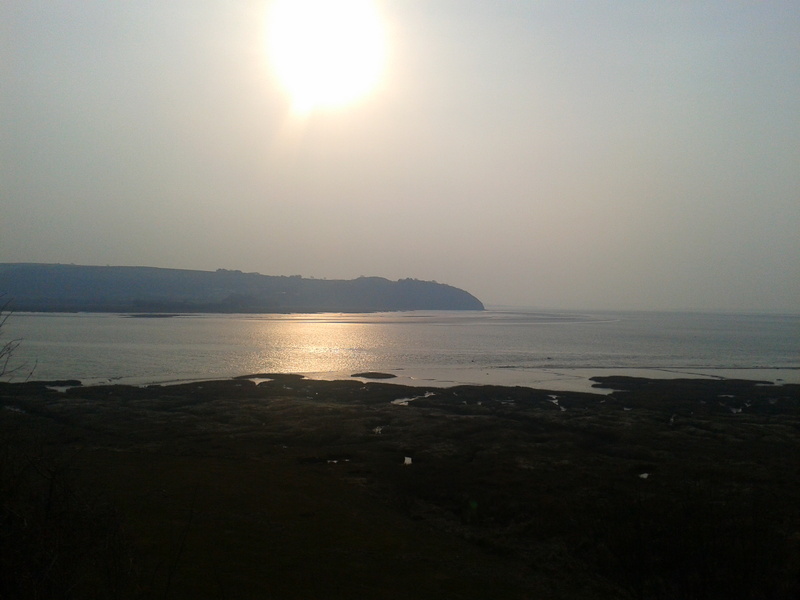 It was completely mesmerising watching the tide going out for miles every day and rushing back in during the evening. I tried to paint it, but the strange thing was, however much you kept your eye on the sand, you couldn’t see the point when it turned to water. I became completely fixated on this, and spend an inordinate amount of time staring at it. I started thinking about how someone running across the quicksand would be dragged in to it, and how such a huge expanse of nothing would always remain so – no one could built on it, or indeed do anything with it. Permanent limbo. I began to feel more and more passive, as if I was being sucked out with the tide every day, and drawn back in at night. Very enjoyable, but rather strange. During the time I was there, I also nipped up to the congregational church, and spent a few hours at the piano. The church, with its wooden pews, is large, light, and spacious, and has the most extraordinary acoustic, a natural amplification that almost overloads if you sing too loud. That too was quite odd, as I was trying to write a song about the tidal experience. I recorded it on my mobile but haven’t played it back yet. Not sure if I want to hear it again. After all this I began to feel light-headed and was quite glad to get back to my prosaic life in Cardiff, and start tapping on the computer again. I’ve been listening to songs by Molly Drake this week, in preparation for the Laugharne Weekend literary festival. There’s going to be an event about Nick Drake with his producer Joe Boyd and a few singers, including Robyn Hitchock, Katell Keineg, and myself, are going to perform some songs, as a kind of illustration to the talk. When I was asked to do it, I immediately thought of Molly Drake, since I’ve been very fascinated by a new collection of her work, out on Alimentation records. Molly was Nick’s mother, and a very talented singer, songwriter and pianist who played for friends and family, rather than in public. Her songs are fresh, melodic, and musically sophisticated. They seem quite light in tone but actually there’s an undertow of melancholy in all of them. They take me back to my childhood, in that her style reminds me very much of my mother’s singing, which was fashionable in the forties and fifties but was swept away by rock and roll. 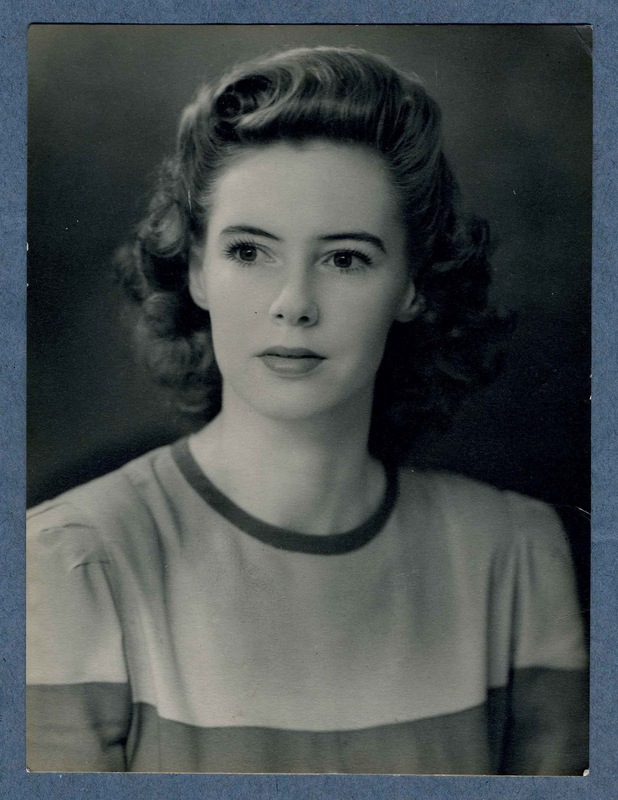 In the early fifties, my mother Susan Stutchbury (as she was then) was a student at Cambridge where she met Julian Slade, the composer of the musical Salad Days. They became friends, and she went on to star as the leading lady in his first production, Bang Goes the Meringue! Later on, when she married and had children, she stopped appearing on stage but continued to sing constantly around the house. The same was true of her great friend, Angela Haswell, my godmother, who also had a beautiful voice. These women, who by the way were the first generation of women to graduate from the university with proper degrees (before that, if you were a female, they just gave you a piece of paper saying ‘well done’), were remarkably talented in many ways, but in those days, once you married, you gave up any kind of serious work or public life. Today I went down to the Gwent Levels, a post-industrial landscape of muddy ditches and dykes running alongside the Bristol Channel,overlooked by chimneys of Newport and the massive steelworks at Tremofra. Not exactly picture postcard country, but nevertheless fascinating. This is a non-gentrifiable area of scruffy smallholdings, scrapyards, cheaply built houses, and untidy fields that seems curiously Dickensian, or perhaps outside time altogether. Small ponies graze by the roads; cows amble along the levee by the sea; old men wander on the beach with buckets, looking for shellfish. At one roundabout, we passed a car going the wrong way, full of children, with a pony on a lead trotting alongside it. 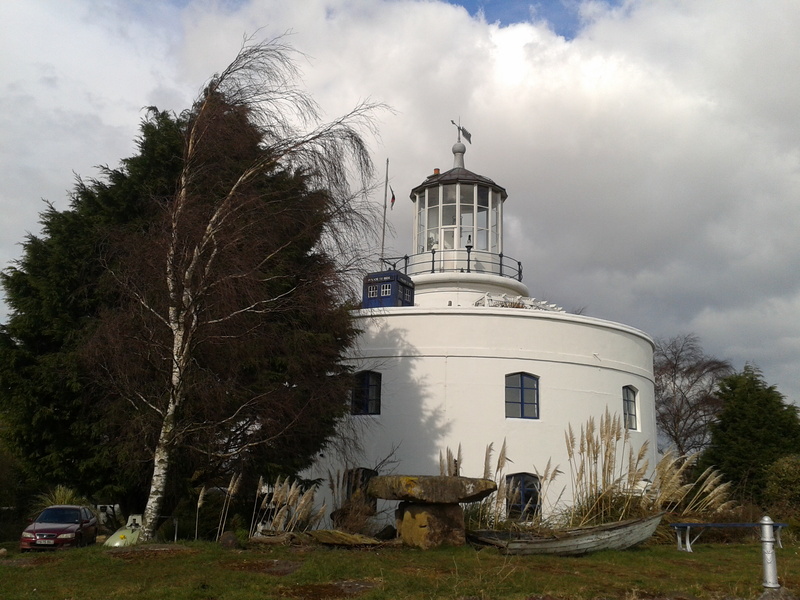 We walked for about a mile by the sea, then came to this old lighthouse, which happened to have a Dr Who tardis on the balcony. You can just see it in the picture above. It’s not the first time I’ve seen the tardis – a couple of years ago, it appeared in the park opposite where I live. It’s one of the curiosities of Cardiff and its environs that it pops up from time to time when least expected. This week, I also drove across country to mid Wales, in freezing rain. Despite the cold, there were signs of spring everywhere: clumps of snowdrops by streams, banks of daffodils, wobbly lambs feeding from their mothers, their tails wagging furiously. I watched a field full of them running about in a bunch, playing together, getting up to mischief, like children in a school yard. It made me feel quite guilty about the lamb shoulder we ate last night (delicious). Still, I suppose there wouldn’t be any lambs if we didn’t eat them. If that makes sense. 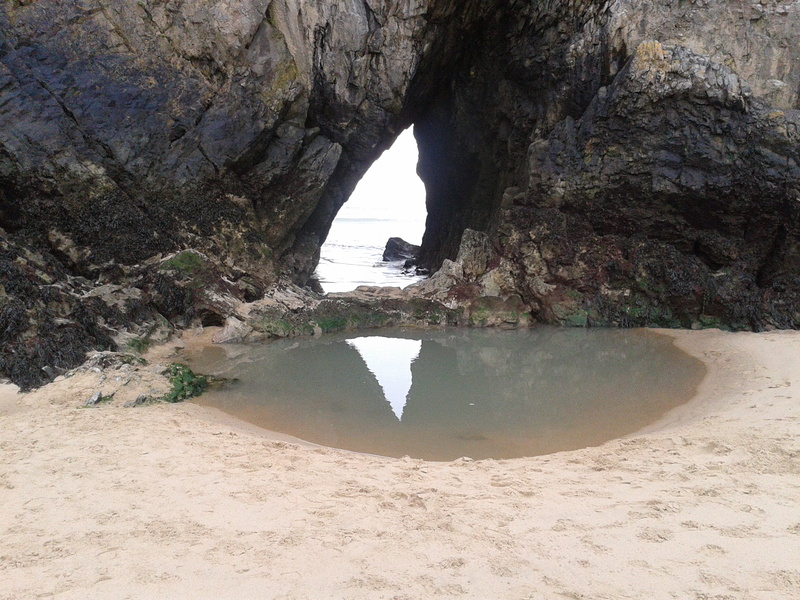 Yesterday I went down to Three Cliffs Bay in the Gower, one of the most beautiful beaches I’ve seen ever, anywhere. There are three pointed cliffs that rise up on the headland, and there’s a ‘door’ through to the sea, casting a triangular reflection in the water below it. The sand is pale and fine, and the waves white and foamy. Really magical. 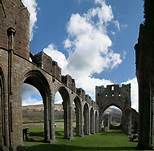 You have to walk about a mile to get there, past a ruined castle on top of a hill, so it seems very remote once you do. Aside from beachwalking, I did a short tour of bookshops in the area to promote my new book. As everyone knows, it’s a very challenging time for all bookshops at the moment, especially independent ones. I hadn’t realised just how much hard work goes into getting our books on the shelves for the public to buy – booksellers, reps, and others. These are people who are passionate about books, and prepared to do everything they can to keep our bookshops on the high street. On the way down to Cover to Cover bookshop in Mumbles, where I did an event with the crime writer M. R. Hall, we passed the huge Amazon warehouse in Swansea. The sheer size of it, in comparison to the small bookshop, told its own story. I completely understand why people buy online, but it would be tragic if we let our high street bookshops disappear completely. 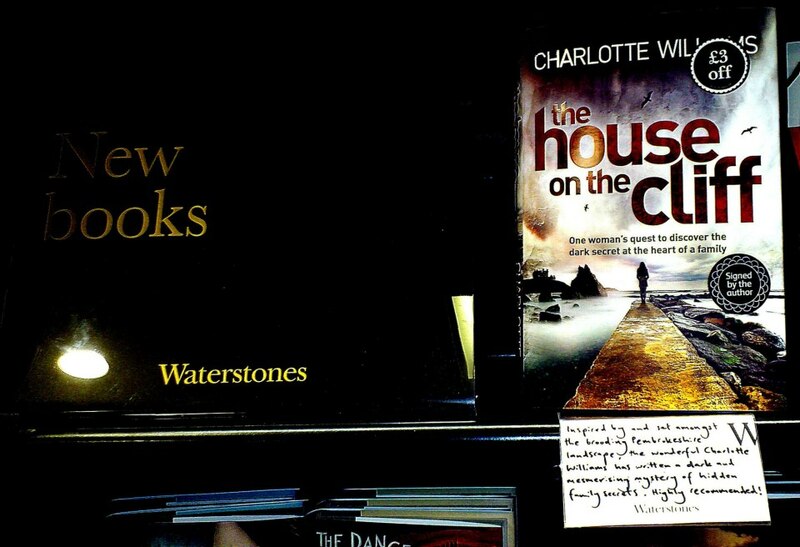 Speaking of which, here’s a photo my good friend Anthony Reynolds took of my book on display in Waterstones with the shop’s review beside it. Much appreciated.